IT organizations are very different today compared to ten years ago. Many IT admins are moving their network infrastructure and equipment to the cloud. As a result, the on-premises environment is without routers and switches, except for the wireless infrastructure. Many cloud applications are moving to the cloud as well, so there aren’t any servers on-prem either. 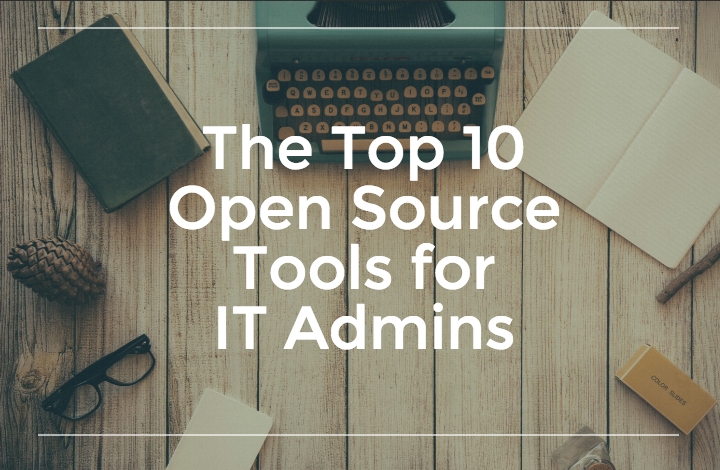 In a cloud-forward organization, the question then arises: what are the best open source tools every IT admin should know how to use? We compiled a list of the must-have tools from our vantage point. Linux – An open source list must start with perhaps the greatest open source project ever created. While IT admins may not be spinning up a lot of on-premises servers, they will still need to use Linux to run many of the tools that they’ll need, whether on their own machines or out in the cloud. Python – Often the programming language of choice for IT admins, Python is approachable, fast, and structured. Most tasks can be accomplished with a small amount of code, and for IT professionals that’s important. There are, of course, drawbacks to Python, most notably, its lack of parallelism. However, Python is an excellent tool for many programming projects. Vim – Perhaps the most popular editor among IT professionals, Vim is easy to learn and powerful. Nagios – Possibly the leading monitoring solution, Nagios allows admins to monitor the online function of systems and processes, ensuring peak performance. OpenVPN – Connecting securely to your off-premises Infrastructure-as-a-Service provider can be easily done with OpenVPN. Alternatively, OpenSWAN is a great open source tool for an IPSEC VPN. OSSEC – A great host-based intrusion detection, file integrity, and log monitoring system, OSSEC helps determine if your device has been compromised, or is experiencing application-, OS-, or hardware-related problems. You’ll need to spend some time setting it up so that you aren’t inundated with alerts, but it’s time well spent. FreeRADIUS – RADIUS has become the common protocol to backend a wireless infrastructure. It connects the wireless access points to the directory, ensuring that access to the company network via wireless is secured with user credentials. In short, you’ll no longer worry about your SSID and passphrase being shared, necessitating a passphrase change every time someone leaves the company. Nmap – Do you know which ports are open on your servers? Nmap helps you know what’s open and what’s not. Nmap can be easily scheduled so that you are routinely updated about what’s open (and listening) across your network environment. Nessus – Scanning devices for vulnerabilities is important in the modern security environment. Nessus helps you scan for weaknesses across your device infrastructure, whether it’s laptops, desktops, servers, or network infrastructure equipment. OpenLDAP – The most popular open source directory service is OpenLDAP. LDAP has become one of the core authentication protocols for Linux-based infrastructure. While Microsoft Active Directory is often the choice for directory services in existing companies, new companies routinely opt to avoid Microsoft solutions. We’d be remiss if we didn’t talk about a few very cool IT admins tools available for purchase. PatchSimple – Patching your machines is always a painful experience. This freemium, SaaS-based solution helps make it simple to patch your Windows, Linux, and Mac devices, along with associated applications. Meraki WAPs – We love the Cisco Meraki system. It’s easy to setup and use. One of the benefits of using WAPs is the elimination of wired cabling and its associated equipment. JumpCloud Directory-as-a-Service – Of course, we have to mention our own solution! Using DaaS means that you can easily connect your users to the IT resources they need and increase security. That’s a pretty nice win-win scenario. Drop us a note if you have any other ideas about great tools for IT admins.